This survey only provides a snapshot, and 500 respondents is by no means representative of the District and Montgomery County, the two municipalities within the region where dockless companies are operating. Nonetheless, it’s the first survey about dockless put out to the world since DC launched its pilot in October 2017. As of May 11, DDOT has released their own; respond to it here! Respondents to Greater Greater Washington’s survey generally approve of dockless bikes: 44.51% (223 people) said they loved the human-powered dockless bikes, and 41.72% (209 people) said that they are fine. E-bikes were more popular, with 50.10% of respondents (250 people) saying they loved them, and 29.46% (147 people) said they liked them. Scooters were the least-favored option among our participants, 31.14% of whom (156 people) said they loved them and 39.92% (200 people) said they liked them. 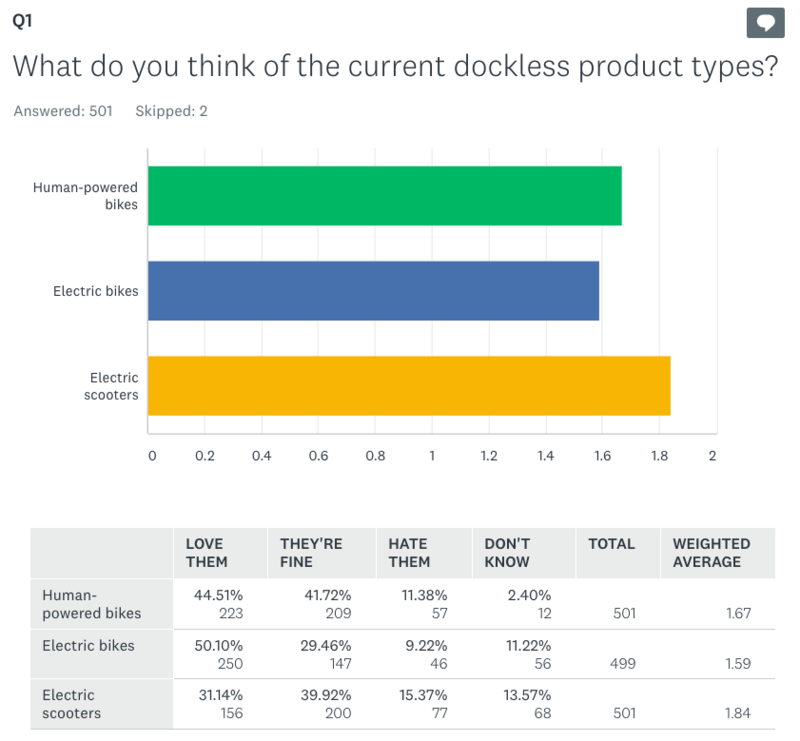 Avowed hatred toward any given mobility device was clearly a minority: 11.38% (57 people) expressed that sentiment toward the human-powered dockless bikes, 9.22% (46 people) toward electric bikes, and 15.37% (77 people) toward electric scooters. Some of the more popular approaches selected included “require efforts to serve underserved populations” (60.64%); “require some rebalancing to outer neighborhoods” (53.68%); “mandate better kickstands to prevent tipping” (41.75%); “require locking to a bike rack or a sign” (30.82%); and “low permit fees for companies” (30.42%), but not no fees at all (only 6.36% selected no fees). The addition of this type of infrastructure — drastically more bike infrastructure, and drastically expanded space on streets for non-drivers—does not need to be built specifically for dockless bikes and scooters. Dockless is a complement, not a threat, to existing multimodal options, and DC’s built environment should reflect that. As I wrote for CityLab last month, “Dockless bikes should, rightfully, force a referendum on who we say our streets are for through how we design them.” Many of the most substantial things that cities, including DC, can do to manage dockless in a way that makes it work best for the general public will also make streets better, and safer by creating more space for vulnerable road users. This may be politically unpopular among those who prioritize parking, but it is increasingly emerging as a necessary step that will satisfy not just dockless management, but also Vision Zero and Move DC goals. For example, Move DC has a stated goal of increasing the current 5% of all commuter trips made by walking or biking to 25%. Meeting that goal is going to take a shift in city priorities. In a recent blog post, San Francisco Planning and Urban Research frames synchronized access to myriad mobility options as “mobility as a service,” arguing that this is an area in which the public sector should take the lead. Our survey respondents’ preferences follow this line of thinking. Users were also able to write in comments, which can be viewed by clicking on “responses” in the survey results page. It’s likely that Greater Greater Washington’s extended community members are predisposed to accept new things in the public realm, like dockless bikes and scooters. However, this survey notably reveals a growing appetite for more radical changes to DC’s physical streetscape, including taking space away from drivers, in order to accommodate these new options.